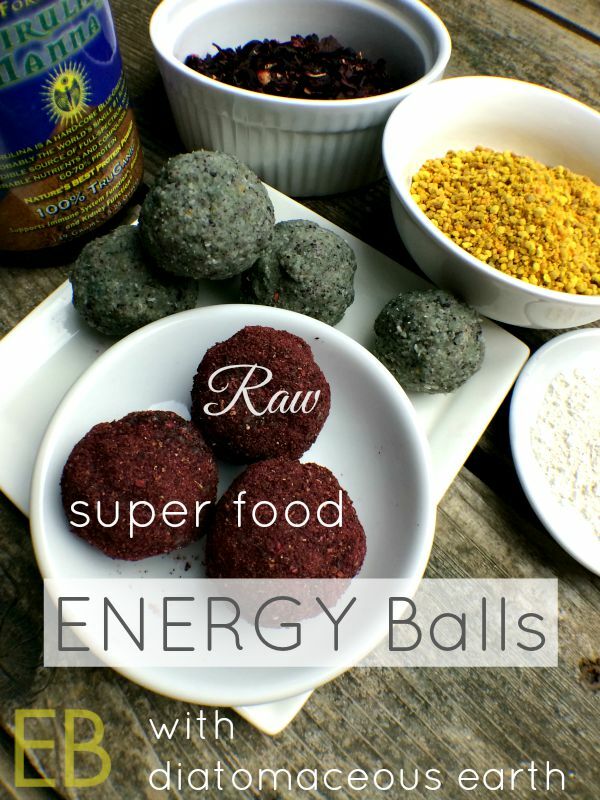 Raw ENERGY BALLS with 4 Super Foods & Diatomaceous Earth are Paleo-friendly, GAPS and egg-free. Below I discuss each of the ingredients and what makes these ingredients super foods. 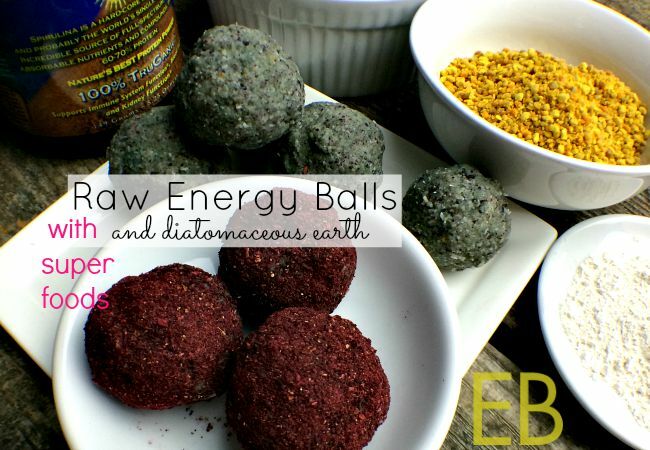 From an eating perspective — Hibiscus-dusted energy balls make your mouth buzzy and happy. From a nutritional standpoint — They’re not full of high-fructose fruit, such as dates~ which aren’t bad; don’t get me wrong. I love dates. But I wanted an energy ball that was low-sugar, no nuts, easy to digest and genuinely a super-food ball. I think I’ve created just that and it’s delicious! It’s also rich and satisfying, so perfect for a grab-and-go snack. I’m pleased with the nutrient-dense ingredients: coconut, hibiscus, bee pollen, spirulina, honey, diatomaceous earth and lime oil (optional). 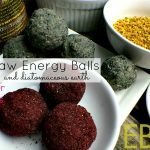 My favorite way to eat the balls is rolled in the powdered dried hibiscus blossoms. This gives them their added citrusy zip that is quite energizing and happy-making. Hibiscus– This flower is a personal favorite of mine. I drink hibiscus tea every day, home made from the loose blossoms, loving its restorative qualities and the high dose of vitamin C I gain. Hibiscus can help with sleep issues and is known for its crazy-high levels of antioxidants. To learn more about hibiscus, see my post here. What’s really cool in this recipe is eating the blossoms, instead of making them into tea, by powdering them in the blender. They are super citrusy and make a lovely dusting for the balls. You really taste the zing as the powder hits your tongue and lips. And the zing feels fun and exciting. What a way to receive energy! Even the power of taste can impart energy to us, when it’s followed by the nutrient-dense food that provided the flavor! Bee pollen– Containing over 5000 enzymes, according to Sally Fallon of Nourishing Traditions, bee pollen has tremendous detoxifying effects. It is also noted to help with allergies, bowel complaints (constipation and diarrhea), anemia, arthritis, cancer, and hormone regulation. Sally also says, “Bee pollen contains 22 amino acids including the eight essential ones, 27 minerals and the full gamut of vitamins, hormones and fatty acids.” It is linked to long life and endurance. Spirulina– High in minerals (think leafy greens) and protein, this algae is also easy to digest and absorb. It is high in calcium and antioxidants as well as B complex vitamins, vitamin E, beta-carotene, magnesium, potassium, iron, zinc, and phosphorous. Coconut– Coconut butter, or manna, is full, of course, of coconut oil. Coconut oil is full of medium-chain-triglycerides. These are fatty acids that are small molecularly, smaller than say, vegetable oils’. They are, therefore, easy to digest and instead of being stored as fats, MCTs, as they’re called, burn right up and become fuel, or energy, for our bodies. This process speeds up our metabolism! (Carbohydrates go through a similar process, the difference being that they produce an insulin spike.) MCTs go one step further; they even help our bodies to burn fat for energy. They’re a great fat to assist healing and to boost the immune system. Also noteworthy for those of us healing our bodies of pathogen overgrowth, a main point of this recipe, is that coconut oil contains lauric acid, a compound that gets converted into monolaurin. I have purchased monolaurin alone for its pathogen killing properties. It is both powerfully anti-viral and antibacterial! This is the just the tip of the iceberg when it comes to all of coconut oil’s benefits. But suffice it to say, whole ground up coconut is a fabulous super food, yielding energy and many healing properties. Stop the motor when the dried coconut is liquified. Add the remaining ingredients. (They're all so pretty!) Process again briefly, just until ingredients are evenly mixed, about 30 seconds, scraping down the sides and bottom once, in the middle, to help evenly incorporate all the ingredients. Roll mixture into 1 inch balls and place them on the prepared cookie sheet. Freeze them for 15 minutes and then roll each ball in the leftover powdered hibiscus, as desired. Balls can be refrigerated long-term, in a sealed container, until ready to serve or snack on. They can also be frozen; but they're really hard to bite into when they're that cold- yummy too! *Here is a tutorial on how to make coconut butter. *Here is the kind of lime oil that I use in the kitchen for cooking. Have you used DE in a recipe before? You threw me at DE since I think of it to ward off bugs in my garden. Love this recipe. Can’t wait to try it. Yay, Anna!! I know; it’s a paradigm shift! 🙂 I am so happy with this recipe and know you’ll love it! 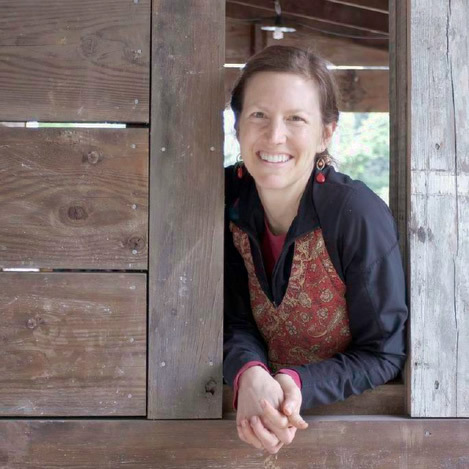 I am loving learning from you Megan! What a creative recipe. Thanks for sharing it with us. Love these convenient ways to work in superfoods! I had to make an egg-free one too, 🙂 for my son and any other egg-free folks. All the superfoods! I love easy ways to get in them in. I was taught by my doctor to take DE 15 minutes before a meal; and many scientific sources recommend adding DE to smoothies. Also, DE works by attracting bad bacteria to itself: it has a negative charge and it attracts positively charged pathogens. Based on these examples I believe it is safe to eat DE with super foods without losing the super foods’ nutrition. Is there an alternative to the hibiscus flowers? Otherwise I have everything to give these a try! I think you could just omit them! 🙂 Or you could use a coffee grinder to finely blend lavender, rooibos, or another loose tea.